Happy Monday to you. Hope your week-end was half as good as mine. 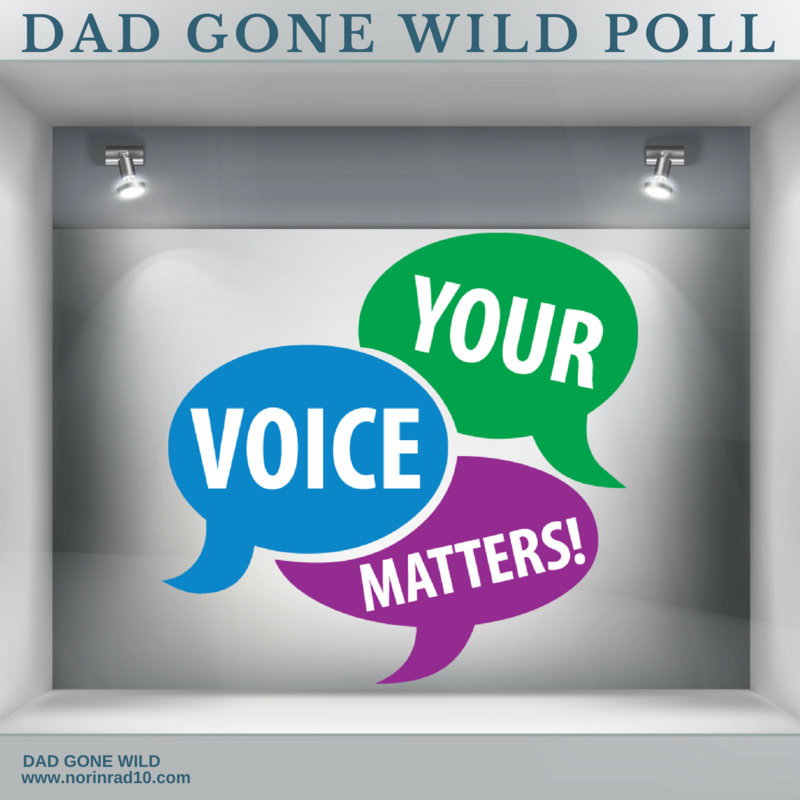 I have to admit to being thrilled with the number of poll responses we got this week-end. Some of you really brought out the creativity when responding to the questions and I love it. We’ll get to those answers but first a few news items. Everybody is pretty well versed on the Tennessee Achievement School District and it’s ever increasing issues. What you might not be familiar with is the TN Department of Education’s latest scam, I mean plan, affectionately known as the Partnership Zone. Personally I’m not a fan of the term “turn around” as it relates to schools. In my eyes it’s a concept that benefits adults more then kids. When is a school considered “turned around”? Is it 3 years? 5 years? 10 years? If a school comes off the naughty list and then slips back onto it 4 years later, was it ever turned around? I wish we would just focus on making quality, equitable schools instead of try to create resume content for adults. McQueen said in the Partnership Zone, the five schools would be placed in a separate mini-zone with its own director and board, giving the schools increased autonomy and support. But that would require a change in state law to allow students to be represented by an appointed, rather than elected, school board. McQueen said she’s spoken with Hamilton County lawmakers and plans to pursue legislation that ensures the Partnership Zone can legally move forward. Did you get that? My question would be, if the state law is changed, what is there to prevent districts across the state from changing the make up of their school boards? This is a potentially slippery slope and I urge advocates across the state to to keep abreast of these developments. I especially like how McQueen says, “We didn’t want to come here with a stick. We didn’t want to come here with some misconception around what this was about. And we didn’t want this to be seen as us not being true partners.” Yet she also states that unless the schools post higher- than-expected academic growth, it’s likely at least some will be taken over by the state if the Partnership Zone is not approved. Kinda of setting the partnership parameters early aren’t they? 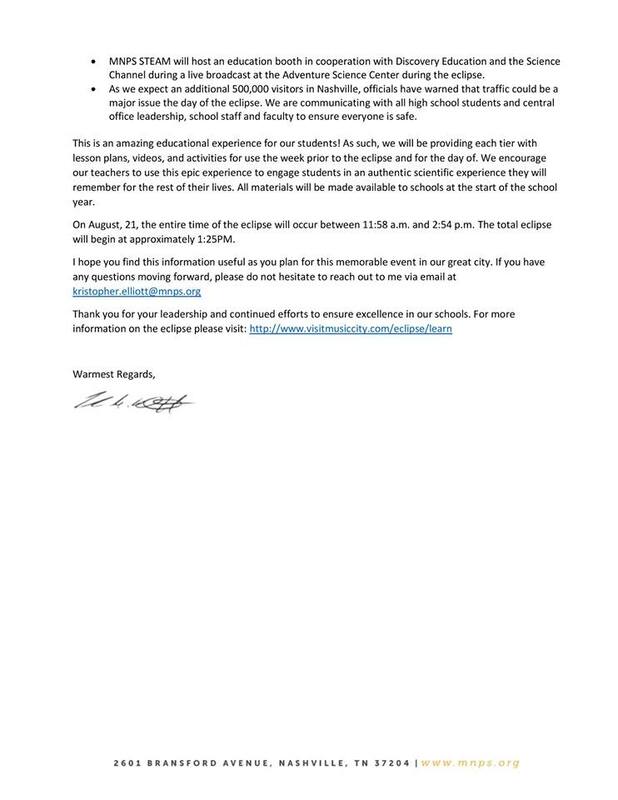 Parents continue to struggle to get information pertaining to the Great American Solar Eclipse. MNPS originally scheduled students to be out of school that day and for it to be a professional development day for teachers. That decision was reversed last week and students will now be in school. The last minute change has left many parents and teachers extremely frustrated. In their response to criticism, board members’ have attributed the decision to a request by the Mayor. Why they feel the need to pull her in to the e controversy is a mystery to me. If it’s the right decision just own it and allow people to vent their justifiable frustration. If it was a popular decision and people were celebrating, would they highlight the mayors involvement? 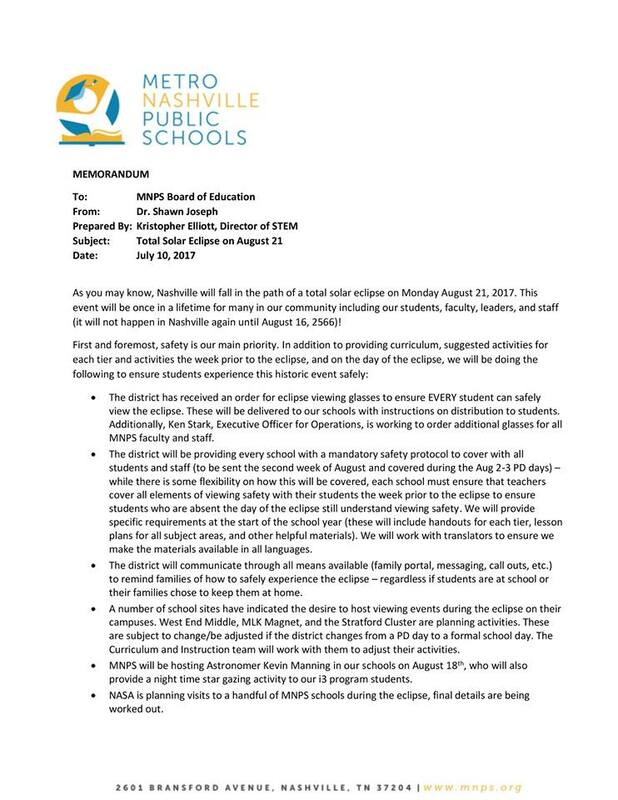 This is the second unpopular move in almost as many months that MNPS leadership has tried to make the mayor accountable for. Here’s a tip, in looking for a scapegoat, you want to find someone with a lower approval rate then you. Not someone who approval factor eclipses yours. Pun intended. To compound things, despite the schedule change being approved, MNPS has inexplicably not made the revised schedule publicly available. What the thinking here is beyond me. Word I get is that the professional development day will be the Friday before Labor Day, thus creating a 4 day week end for students. MNPS’s STEAM department headed up by Kris Elliot has been very busy making sure that the upcoming event is fully taken advantage of. Last week a update on actions was released. I’m not sure of the impetus of this article but as always she makes some salient points and I encourage you to read her piece. The Brentwood Community continues to explore the idea of splitting off from WCS. The idea is not a new one but purportedly this time the catalyst for the new grassroots effort was when the Williamson County School Board introduced a district-wide rezoning plan in the spring that would have sent students from Brentwood schools to Fairview, Franklin and Nolensville. Read and decide for yourself. through a grant project of Conexion Americas’ ​Education Policy Team​. 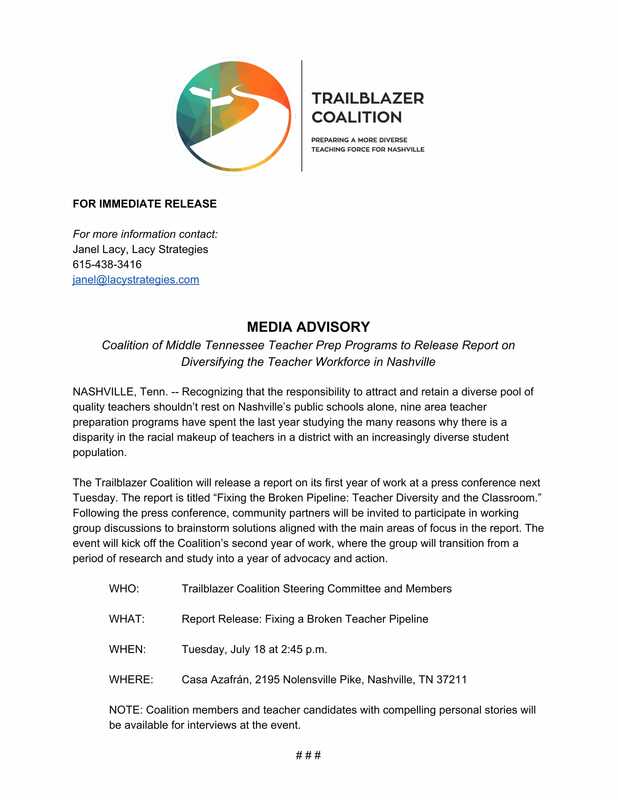 On Tuesday at 2:45 PM at Casa Azafrán, 2195 Nolensville Pike, Nashville, TN 37211, they will release a report on its first year of work at a press conference next Tuesday. 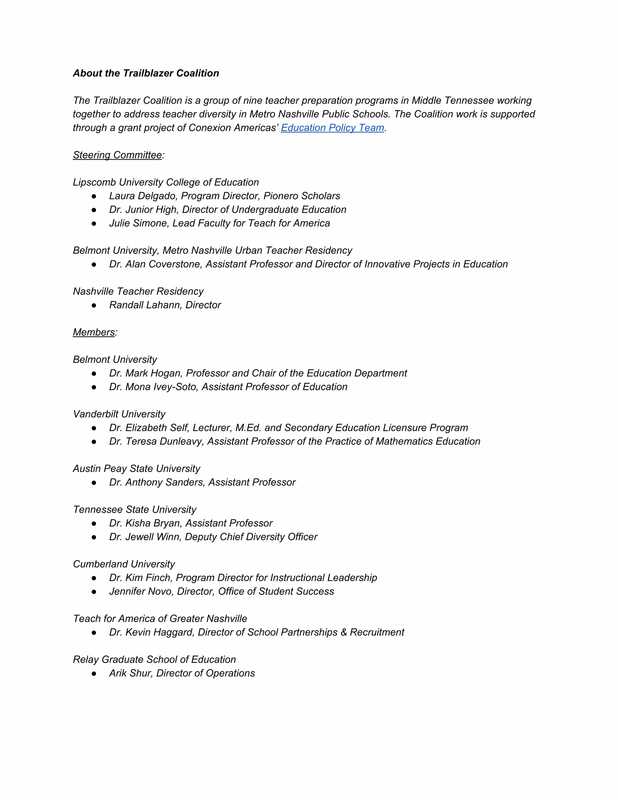 The report is titled “Fixing the Broken Pipeline: Teacher Diversity and the Classroom.” Following the press conference, community partners will be invited to participate in working group discussions to brainstorm solutions aligned with the main areas of focus in the report. The last weekend in July has been designated as a tax free weekend in Tennessee. So mark your calendar. As I mentioned earlier, this week we had a great response to our poll questions and some of you answered quite creatively. It’s one of my Favorites in Safari. I read it daily. The second question asked what is the number one trait a leader must possess. 31% of you answered authenticity. Which was reaffirming for me, as it is something I preach. All the other traits are important, but if people don’t believe in you, it’s all meaningless. People have to believe that you are going to act in the manner you speak. It’s a lesson current MNPS leadership has failed to grasp much to their detriment. Hopefully 2017-2018 will be the year of the awakening. Great write in answers for this one as well. The last question asked for the best burger joint in town. It did my heart good to see old Nashville favorite Rotiers take it with 25% of the vote. Second went to a personal favorite Gabby’s. I urge you to try both of them as well as other mentioned joints. The Pharmacy won the write-in votes. There you have it. Only 3 more weeks to school. We’ll keep you up to date as we get more news. Next CHATT TOWN, BIG EASY TRIPS AND WHAT’S THAT STAND FOR? Innovation usually is code word Personalized Learning (in my opinion….de-personalized) which is nothing more than sitting students at a desk with a computer all day. Drill and kill computer skills in lieu of a true education. Testing at the end of every module. You should be very concerned about this due to Dr. Joseph’s strong connection with Dallas Dance (former Balto Co Superintendent) who just took a big ed-tech job. Please read and be aware. Also, you should be look out for the name Renee Foose. Howard Co finally got rid of her (she was made to “retire” with a boatload of $ attached). She is still floating around in Montgomery Co, Md….home of many ed-tech companies. Her name has not shown up yet, but she was also very friendly with Dr. Joseph. She sat at as a liason between the state and county levels for LDS. Sounds like Dr. Joseph likes to keep his friends employed. Very disappointed with sudden calendar change. 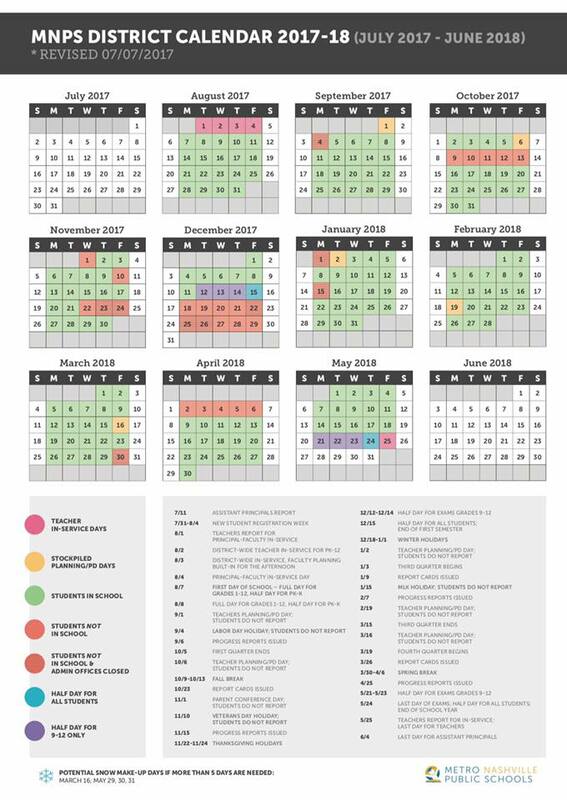 How can we ever make plans, if the school board can change the calendar at the last minute? I want to be with my family on the eclipse day. I already made plans.